"In December, there were too few mushrooms to satisfy demand"
January is classically a tough month for the German mushroom trade. Many restaurateurs close their doors to go on holiday and the large demand for mushroom exotics is very much over after the turn of the year, says Karlheinz Meier, owner of the firm that has the same name. However, thanks to the December sales, the retailer has a good buffer. When looking back on December, the experienced retailer -who is working exactly 20 years in the mushroom trade this year- is quite satisfied. "The sales around Christmas were pretty good. This year has been very good regarding deliveries overall. On New Year's Eve, large quantities were sold as well. Unfortunately, there was not enough product in the mushroom range. 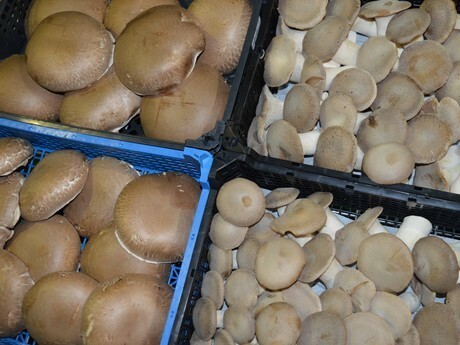 Producers simply could not keep up their production because the demand for mushrooms was very great. This problem arises almost every year." Although mushrooms are still in high demand in the German specialist trade, the major supplier does not notice any clear varietal trends at the moment. "Some new variety can sometimes be very much in demand, but only in very small quantities. There are exotic mushrooms such as golden oyster mushrooms, pink oyster mushrooms, Pied Blues and Pioppinis, to name just a few. But in this area as well, demand is limited." According to Meier, local cultivation of exotic mushrooms like shiitake and king trumpet mushrooms is seeing strong competition from Asian production. "This is far from a mass-produced product, and it is directly marketed by the breeders as well. We still source the lion's share of our exotics from Asia." According to Meier, the mushroom market has increased significantly in recent years as more and more people want to eat vegan dishes. This trend affects the German mushroom sector as well: "My main sales still clearly concern wild mushrooms. These will get going start again in May." In contrast to many other modern cultures, this business is dependent on the weather. Because of the drought, there have been several gaps in the supply in recent years, simply because you can not irrigate forest mushrooms. "Because of this, there will inevitably be a bottleneck in the upcoming season."